"Damn" she swore under her breath. This was not going to end well for bardon. Tunani watched as Imatari walked into the small place, not sure what to do. Bardon jumped when he heard a snarl. "W-what are y-you doing here?!" He questioned, even though the tiger couldn't answer him. 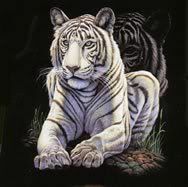 She glared at him as if he was another female tiger in her cubs den. She shook her head once and then threw her head back to the door and turned for him to follow. She was not ahppy and if he even thought about running she'd take him out. Bardon gulped and walked to the door, carefully. He looked back at Ronan. As soon as he was outside, he slid down to the ground outside the small place, bending one knee and resting his arm on it. He looked at Tyler and just stared at her with sad eyes. "I still love you." He whispered again. She Turned away. "I'm sorry"
Bardon looked at Tyler and thought he would start crying like a little kid. He put his head on his arm. Tunani looked up at Tyler with sad eyes. "Tyler, please. I love you. So much. Please, just accept my offer....." He whispered, not sure if she heard him. She looked at him. "No." How on earth could expect her to forgive him. it was INSANITY. But she wasnt mad. She shook her head. "I'm fine thank you"
He looked at her, letting his arm slide down and he stood up, walking towards her. He brushed past her, walking towards the other side of the house. He stopped for a split second and whispered, "Good bye." in her ear. Once on the other side of the shack, he slid down the wall and let his head fall back, hitting the wall. "I can't believe I just did that...." He whispered, a tear sliding down his cheek like a little kid crying over something. His eyes got a little pained. How was he going to defuse this. "Um...candy? Anyone ever tried chocolate?" he asked with a salesmen like smile. It faded as soon as he watched Bardon brush past Tyler and disappear around the building. "Um..you are welcome to look at whatever you would like" he offered to the young ladies. "I'll be right back." At that he disappeared around the building too. He quietly sat down beside Bardon and was silent. He would let him talk first. "Not forever...." He whispered to himself. He pulled out a piece of paper he had and a small writing pencil, placing it on his knee. I love you so much, but if it is your wish to leave me forever, then I wont stop you. Not this time and not ever again. I am sorry about everything I have ever done. I will change myself, even if it means leaving these villages forever. Please accept my apology. He folded up the note, calling Tunani back. Once Tunani was over, he handed him the note. "Give it to Tyler..." He whispered to the lion. Tunani ran over to Tyler and gave her the note, hoping she wouldn't tear it up. Bardon saw Ronan come over and stopped acting like a child. "I don't know what I have done..."
Ronan looked at him "You have shown her that you truly love her because you were willing to let her go" he said quietly. He looked at him with sad eyes. "I have?" He asked with sadness in his voice. Rhea looked at Tyler surprised, She couldn't quite understand all that had happened. She looked up sniffiling. "Yeah. I-i'm fine.."
"Thanks, Ronan. I'm glad you're here." He looked at the man, half smiling. "Guy like me needs a friend 'round here I guess." He chuckled. "it'll get easier over time," Rhea assured Tyler and hugged her for a second, "I promise,"